Michael Bloomberg’s endorsement of Hillary Clinton shows the Democrats are the party of the rich. Why rich voters have found a home among the Democrats. 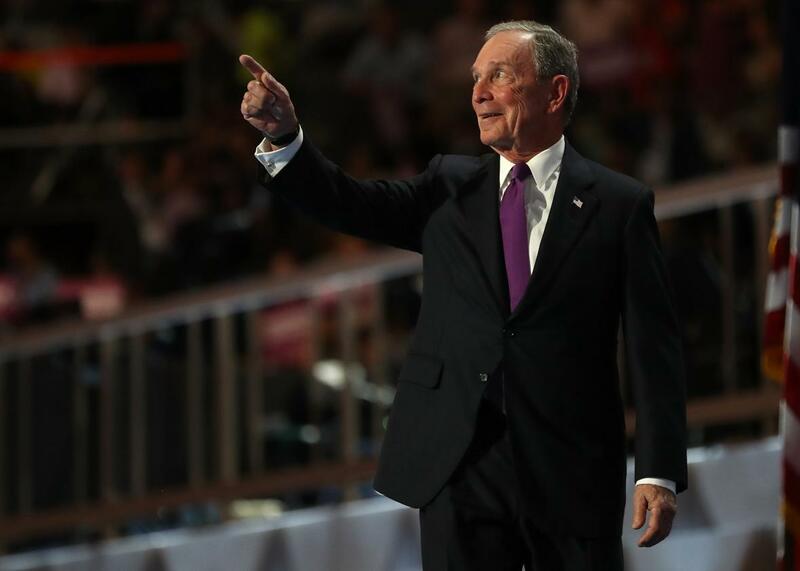 Former New York City Mayor Michael Bloomberg at the Democratic National Convention on Wednesday in Philadelphia. There are very few endorsements that are going to matter in this presidential election, but Michael Bloomberg’s might be one of them. On Wednesday night in Philadelphia, the three-term mayor of New York City called on his fellow independents to vote for Hillary Clinton. “I am asking you to join with me not out of party loyalty, but out of love of country,” Bloomberg said. Why? Is it because he’s so enthusiastic about her many virtues? Nope, it’s because a Trump presidency would be an unmitigated disaster: “He would make it harder for small businesses to compete, do great damage to our economy, threaten the retirement savings of millions of Americans, lead to greater debt and more unemployment, erode our influence in the world, and make our communities less safe.” Ouch. Bloomberg’s savage attack lines may well give Clinton a boost in November. But it was not so long ago that he thought seriously about running for president himself. Fearing voters might be left with a choice between Donald Trump and Bernie Sanders, the centrist billionaire devoted substantial time and resources to laying the groundwork for an independent presidential campaign, an idea he’d toyed with for years. When it became clear Clinton would prevail in the race for the Democratic nomination, Bloomberg broke the hearts of hundreds of high-priced political professionals by deciding not to run. What tipped the scales for Bloomberg? It certainly wasn’t a reluctance to spend money on a presidential campaign. In addition to the tens of millions he spent to win three terms as mayor in the nation’s most expensive media market, he’s devoted millions more to promoting gun control, comprehensive immigration reform, and a host of other causes. It doesn’t hurt that Bloomberg has amassed a fortune more than 10 times as large as Donald Trump’s. Nevertheless, Bloomberg concluded the most likely result of his candidacy would be to tip the election to either Trump or Ted Cruz, both of whom he condemned as divisive nativists. Had Bloomberg done nothing more than stay on the sidelines, the Clinton campaign would have been quite content. The fact that he showed up at the Democratic convention is icing on the cake. It is also, I suspect, a sign of things to come. To most sophisticated political observers, the main takeaway from this year’s Democratic presidential primaries is that the party is moving decisively to the left, as demonstrated by the outpouring of votes, enthusiasm, and small-dollar donations for Bernie Sanders, the self-described democratic socialist from Vermont who joined the Democratic Party only very reluctantly. The fact that Sanders energized younger Democrats more than older ones has been taken as a sign that the future belongs to left-wing Democrats who will follow in his footsteps. There is, however, another possibility: What if the Democratic Party’s future winds up being more Bloomberg than Bernie? To conservatives, Bloomberg has long been a donkey in elephant’s clothing. Before running for mayor of New York in 2001 as a Republican, he’d been a Democrat for years: By all accounts, he ran as a Republican primarily to avoid an expensive race for the hotly contested Democratic mayoral nomination. When Bloomberg re-registered as an independent in 2007, it was a much better fit. Mitt Romney did try to wheedle an endorsement out of Bloomberg in 2012, and Bloomberg told friends he thought Romney would be better at running the country than Obama per a private conversation that was leaked to the New York Times. But Bloomberg never took the idea of endorsing Romney seriously in light of their strong disagreements over abortion and gun control. In his last-minute endorsement of Obama’s re-election bid, Bloomberg strongly implied that Romney’s views on social issues were a dealbreaker. It turns out Bloomberg wasn’t alone in this regard. There are millions of voters like Bloomberg—call them the “Bloombourgeoisie”—who might have voted for Romney if not for his stances on social issues, just as there are millions of voters who never would’ve voted for Romney if he hadn’t flip-flopped on abortion, and if he’d supported an amnesty for unauthorized immigrants. Republicans have built a coalition that is a far better fit for culturally conservative working-class whites than it is for the Bloombourgeoisie. If Donald Trump is any indication of where the GOP is heading, that trend will continue in the years to come. Recently, Lee Drutman, a senior fellow at the think tank New America, argued that Democrats have replaced Republicans as the preferred party of America’s wealthiest voters. In 2012, Barack Obama won a larger share of the vote of households earning $220,000 or more than Mitt Romney, the first time since 1964 that voters in the top 4 percent of household incomes backed a Democrat over a Republican. It’s a safe bet that many of these well-off voters chose Obama over Romney for the same reasons Bloomberg did: RINO Romney was just too right-wing for their tastes. And if these voters couldn’t warm up to Romney, you can only imagine how they’d feel about Trump. For most of the past half-century, the Republican edge among the rich has been quite substantial. But since 2000, it’s been drifting downward, a development that Drutman attributes to the Democrats’ rising strength among educated voters coupled with the fact that today’s rich voters are more highly educated than rich voters of decades past. It’s also the case that for many upper-middle- and upper-upper-income voters, tax cuts are not nearly as big a draw as social liberalism. What’s a slightly smaller federal tax burden worth to a voter who’s already pretty comfortable? Besides, on issues like free trade and balanced budgets, Hillary Clinton is far more “conservative” than Trump, a populist who favors tariffs, border walls, and policies that would cause deficits to balloon. Indeed, as far as Clinton is concerned, Libertarian Party nominee Gary Johnson is probably a bigger threat to peel off votes from the socially liberal rich than Trump is. Which brings us back to Michael Bloomberg, the consummate “socially liberal, fiscally conservative” political figure. This is not to say that Bloomberg’s a libertarian, as evidenced by his jihad against cigarette smoking and sugary soft drinks and his defense of stop-and-frisk. Instead, he is best understood as a business-friendly moderate, a politician who’s never seen eye-to-eye with liberals who are exercised by rising economic inequality. To Bloomberg, it’s perfectly natural that a city like New York would be extremely unequal—what else do you expect when you have an economy in which low-wage immigrants make a living by catering to the needs of high-wage professionals? Having made his fortune by putting high-tech terminals in the hands of Wall Street traders, Bloomberg isn’t one to bad-mouth the big banks either. After all, it’s bankers’ bonuses that keep cab drivers, doormen, and servers of all kinds employed. Where Bloomberg parts company with let-them-eat-cake types is in believing that low-wage workers should be provided with Medicaid, SNAP, and high-quality charter schools for their kids, because it’s the right thing to do and because, to be blunt, it’s an insurance policy against a reprise of the French Revolution. It’s not an entirely crazy political philosophy, and it’s shared by a decent number of upscale urban liberals and suburban moderates. Bloombergism is not far off from the progressive Republicanism once represented by Nelson Rockefeller and Jacob Javits. What it’s emphatically not is Sanders-style socialism, which holds that the chief threat to democracy is the outsized power of “millionaires and billionaires” like, well, Michael Bloomberg. Going forward, one can imagine a battle for the Democratic Party’s soul that will pit the Bloombourgeoisie against the Sandernistas with both factions fighting to win over working- and lower-middle-class minority voters. The Republicans, meanwhile, might evolve into a more populist party that rails against the plutocrats of Wall Street and Silicon Valley—the spiritual homelands of the Bloombourgeoisie—just as much as they rail against unauthorized immigration. Is this future inevitable? Not at all. But it is looking ever more plausible.